Back in November, Gregory Kearse approached Daaim Shabazz of The Chess Drum about a possible story. He contacted the United States Chess Federation to propose the idea. Daniel Lucas, the Editor of the newly-revamped Chess Life agreed. Lucas had been a admirer of the website and has stated a previous interest in running a story about it. Thus, the story had the green light. After preliminary questions and numerous e-mail exchanges, enough data were collected to compile the story. Kearse, known for his essay on Black masters back in 1998, produced a draft and found himself facing a demanding Shabazz. After many back-and-forth e-mail on various points of semantics and content, the baton was handed to Lucas who found Shabazz chasing him down with more points of clarification. After countless e-mail and an approaching deadline, a draft was produced. After additional corrections were made, the article went to press. Lucas got help from a Tallahassee freelance photographer Adeleke Omitowoju, a student of Shabazz's. The interview chronciles The Chess Drum's inception along with personal information about the person "beating the drum." The interview also includes from several chess figures. The initial insight and motivation was clearly a product of Kearse's passion for Black chess history. At one time, he had contemplated a book on Black chess history, but for now he will remain an icon for writing essays about matters related to chess in the Black community. 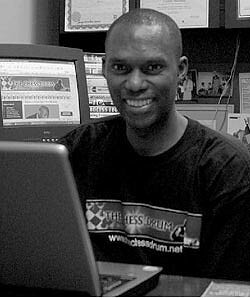 "Daaim Shabazz: Playing to the Beat of a Different Drummer"
Note: This article also appears in the March 2007 Chess Life magazine.